Hi, hope this the right place to post. Aldi have an espresso machine coming up for sale quite cheap. Listed as 15 bar italian pump, thermoblock heating, 1.6L watertank, single & double advanced crema system filters. Is this likely to be any good at all? I am not sure what the filterbaskets are like or their size. I don't know enough about this type of machine to say one way or the other. "Any good" is a very subjective phrase. 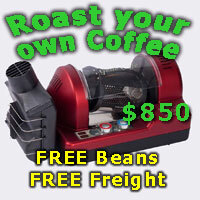 It looks like it will be comparable to the cheapest Breville or Sunbeam. It has a pressurised basket, so won't produce anything most people on here would enjoy drinking. From reading the manual it appears to be aimed at the pre-ground, pressurised basket market, not loved by most CS people. Until someone trys it out we will just have to guess. I am only a new member but I am fast forming the view that good quality beans are more important than the equipment. Would be good to know what size the filterbaskets are incase they can be swapped out. After a point, yes. That point lies somewhere well beyond this type of machine, though. Just by looking at it I'd say it looks similar to a Breville Cafe Venezia, which is 51mm. Its just an entry level thermocoil machine, the same as what all the appliance manufacturers churn out at the entry level market. It will have 51mm baskets, the same as all the others. If you upgrade to single wall baskets, use some quality beans and a decent grinder, it suspect it would make an acceptable espresso. From the manual, the steam arm looks similar to the one on the Breville 800ES so it should be able to make pretty good microfoam with a bit of practice too. If it's the same as the 800ES then remove the outer metal tube and keep the bottom of the steam wand just touched to the surface of the milk. Keep it just touching until up to temp. You lining up tomorrow to pluck this gem from the hands of Aldi ? Bought one to try out as a spare for when my VBM is serviced. Brewed way too hot and the instructions were dodgy (ie, if coffee does not flow, make grind finer!!!). So I returned to machine and got a refund. Aside from the instructions did you make many coffees with it? three or four. left a very bad taste in my mouth.